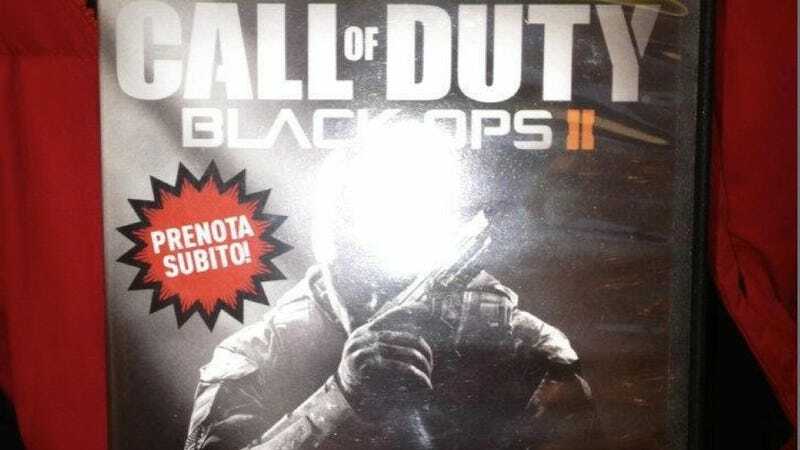 Photo Claims First Look at Call of Duty: Black Ops 2's Box Art, But Is It a Fake? Evidence continues to mount that a Call of Duty: Black Ops sequel is oscar mike. First there was an Amazon listing. Then there was an odd black balling. Then, there was what looked to be a Black Ops 2 teaser poster surfaced—after that, a GameStop teaser website. Now? Now, a photo depicting the game's box art has hit the internet. The box art does resemble the silhouetted art on the teaser site; however, it is of a higher resolution. The box shows the European version of the game. In Italian, the front says, "Prenota Subito" or "Reserve Now". In the corner, it adds notes, "One Per Customer." The photo does send off all sorts of warning bells: there's a convenient lens flare, which is a technique fakers use to pass off phony games; the game box looks like a PS2 case and not an Xbox 360 box. Yet, the font matches up with the rumored poster, and it does depict a high-resolution image of the image teased on the GameStop page. And that image shows Call of Duty: Black Ops 2.